Cheela is a crepe-like bread unique to Telugu cuisine that is similar to dosa. 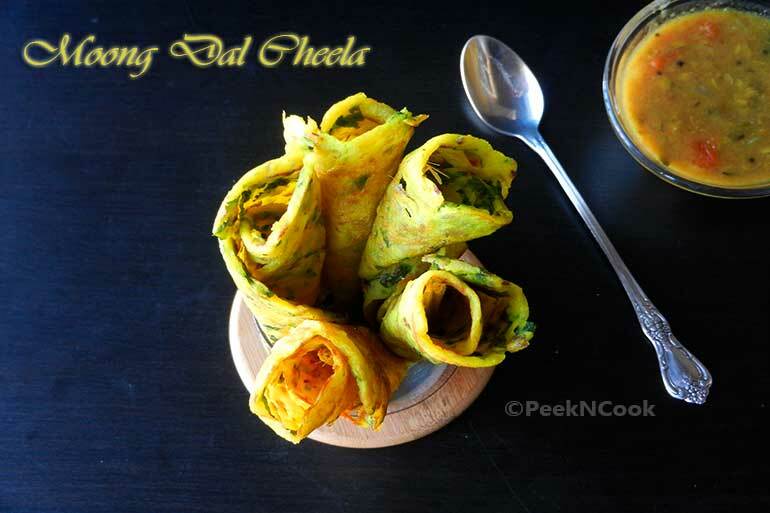 It is made with batter of green gram (moong dal), but unlike a dosa, it does not contain urad dal. Cheela is eaten both in breakfast and as snack that popular in Andhra Pradesh . It is typically served with ginger or tamarind chutney. Green chilies, ginger and onions are used in different variants of this snack. Cheela is a crepe-like bread unique to Telugu cuisine that is similar to dosa. It is made with batter of green gram (moong dal), but unlike a dosa, it does not contain urad dal. Grind the soaked Moong Dal with about 1/4 cup of water in a grounder to make a smooth batter (thicker than a pancake batter). Pour batter into a bowl and add onion, Chopped Chili, fresh cilantro and ginger, Salt, Turmeric, Hing. Whisk them all together. Lightly coat a heavy bottomed pan or nonstick tawa with oil. Drop a ladleful of batter in the center of the pan and spread the batter with a spatula all over the pan or tawa. Sprinkle some oil at edeges of the Cheela to loosen the edges easily. Cook each side till golden brown for at least 2 minutes, turning side by side. When both sides will looks good, fold the cheela and put onto plate. Repeat the same process for the rest of the Cheelas. Serve them with Chatni or Dal.